Ham Radio. I find that Frasier works like comfort food for me . Whenever I'm stressed or want something warm and comforting to soothe me, I put on an episode. Ham radio is definitely one of my personal top ten best. Yesterday on Lifetime, the last episode they played for the day was "Dad Loves Sherry, The Boys Just Whine." Just seen it for the first time, had me laughing myself silly for most of it! I watched Ask Me No Questions today. What does anybody think about the scene where Frasier walks the streets at night agonising about his answer to Niles' question, accompanied by a jazz soundtrack? I don't like it - it strays too far from comedy for me and makes Frasier look like he's lost it! I guess the episode is unique as it's the closest we get to seeing Maris! Just watched, "Where There's Smoke, There's Fired." Great reminder of how awesome Bebe Glazer is - she's great in every episode she appears in. I love Frasier's line, "Don't be silly, Big Willie." I actually like the scene where Frasier walks around with the jazz music in the background. But that's just me. Sounds right to me. I liked it well enough and I thought the music was pretty appropriate. Sure, it might seem a tad too melodramatic for a sitcom, but I guess they were trying to stress just how important Frasier's decision was to him. The last episode I saw was tonight. Season 10 episode 6 Star Mitzvah where Martin brings out his camera. The funniest and most invasive picture taking device I've ever seen! Called the Schmerblast 7XK from Russia. A camera described by Niles as the "blindingest, noisiest 15 pound camera ever produced in the former Soviet Union". Every time Martin took a picture he literally bleached his subjects with searing bright light. Hilarious. My wife and I were gagging with laughter. Yup, I love that camera . Funny thing is, it's one of the least liked episodes of Frasier. I never really had a problem with it. Why is it one of the least liked episodes, PP? Do you mean on the previous forum or has someone done a survey?! I like it. I think Frederick is great in it - 'Gross!' and Noel is good too. And I like the scene where Daphne finds out about Niles and Lilith. (It's also one of the more bearable ones with Lilith in). Interesting point PP. 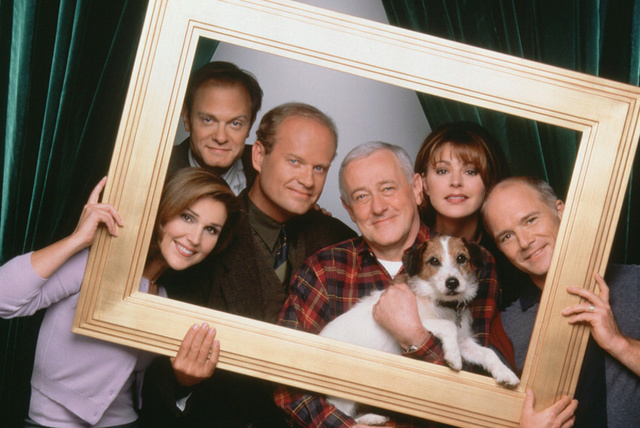 I enjoyed the camera as a comedic device and I love the connection that Lilith and Frasier showed with Frederick. You know what, I can understand why it would be described as. Weaker episode. I'd almost have to look at it again to say why. Is it because Daphne is married and living with Niles? That changed the balance of the show considerably for me. It would appear I confused it with War of the Words <_<. I was sure people hated it and that it had something to do with the fact that Lilith acted a bit out of character when she had that motherly outburst, but it seems it was all in my head. Sorry about that . 'War of the words' is definitely one of the eps I'd happily scratch off my cd collection for good. 'Star Mitzvah' is one of the eps I like best of the later seasons 8 to 11. Oooh, yes, please, I'd like a fresh opinion as well . it's an interesting question you ask. I'm aware about the discussions on the previous forum. Firstly, let me say that my wife and I have done what a lot of people who watch "modern TV" now do - we binge watch. We've watched this series on Netflix at the rate of 1-4 episodes a day. I can tell you also that, for my wife, getting to the point where Niles (finally) declares his love for Daphne was really important. She's romantic like that....lol. I can definitely say that there is a different structure in the show in series 10 than early on. I can think of a number of reasons. The obvious one being that Niles and Daphne have gotten together. The tension of "will they won't they" and the sheer idea that she had no idea has all gone. At its best, that was wonderful. Another thing, Daphne is much less eccentric Daphne of old. She can no longer be the comic counterpoint in so, so many scenes like she was. My observation was that there were numerous 'arcs' across the various series. Many things, were setup in the earliest episodes that took numerous seasons to be resolved. In my opinion, as they were resolved, the show fundamentally changed. The characters changed and grew up. It wasn't the same show as a result. Was that a bad thing? The ratings at the time said it was. My understanding was the show became less popular. So, how do we feel about those changes here? Well, just to repeat, we're watching this at a fast(ish) rate and part of what is interesting and entertaining for us are the changes I mentioned. Examples? Niles is far less a comic character - far more mature after marrying. Frasier has less of a comic foil with him as a result. Daphne becomes much less colourful after marrying. She must be compatible with Niles, mustn't she? In an effort to move the characters forward and "grow them up" the producers/writers of the show changed it. Better/worse? Honestly, at this point, my wife and I aren't critical - not yet. The show isn't the same - it can't be - but it is interesting and so well performed. I re-watched "Star Mitzvah' and I can use that as an example of what I mean. So deliberately did the show's producers/writers want to emphasise that things weren't standing still and that everyone was growing up, they referred on numerous occasions to the idea that 'time goes fast'. 'Don't grow up'. The intimacy between Lilith and Frasier towards Frederick was fantastic. It brought all of them together and us together with them. None of it funny, but strong and nurturing. They're growing as much as Frederick is. There must have been a lot of talk at this point about when the show would conclude. I'm guessing that the producers/writers would have been gearing towards that inevitability almost as soon as Niles and Daphne "eloped" during Daphne's wedding. It was a huge change in the show. There's a lot more to say (obviously) but, just to try and begin to answer the question, we are very absorbed by the show now in season 10 because we've been allowed to experience the growth quickly and we feel as though a good deal of what's happening has become personal. I will say, the show is now much less a sitcom in season 10 than it was in seasons 1-7. The fact that viewers were still watching says a lot about the standard of production/performances doesn't it? So........Eddie2012, PistolPoet.....anyone....did you agree with anything I said? I was hoping we may have had something like an exchange about my last message. Perhaps I've started a discussion under the wrong heading?! I was put off responding as your post was addressed to PP and Eddie2012! But it does frequently seems to happen these days that there is not much response to a post. I agree with you that a lot of storylines were set in motion in earlier seasons that were then resolved and it was hard to find things to take their place. But I don't feel that Niles and Daphne coming together was a bad thing or that the writers were thinking of ending the series as early as Season 8. The characters moved on and evolved but they have to do that on such a long running show. You can't have characters struggling with the same issues season after season. As viewers we have to move on with the characters. I think it comes down to - do you want real characters or just comic ones? Personally I thought the whole Niles Maris thing went on too long. Niles was becoming seriously tedious with all his suffering about Maris and it was no longer funny so it was a big relief when he moved on from that. Same with Niles and Daphne. I think Niles stays funny - just in a different way. I'm really sorry, but for some reason this topic (and I hope it's just this one) failed to turn red for me when there are new posts, so I missed the last three posts. I only stumbled in here accidentally when I saw the last post had yesterday's date on it. Tasos, I think you bring up a very interesting point when you say that, after Niles and Daphne got together, she could no longer be a comic counterpoint. The thing is, I think she could. Sure, Niles and Daphne had to be compatible at least a little for the relationship to work. However, the writers could have played more with the "clash of the worlds" theme - Niles taking Daphne to the opera, Daphne teaching Niles about the intricacies of the plot of her favourite soap opera etc. They had that one touching moment at the end of Daphne Returns, when they realised how different they were, but that it didn't matter in the long run. So the writers could have kept that dynamic all the way through. Instead, they made Daphne snappy and bossy and sarcastic. I understand that they wanted to make them both grow and change, but I don't think they handled Daphne very well. She could have stayed her silly, kooky, cheerful self and at the same time she could have grown in other ways. I feel like the writers may have mistaken "growth" for "seriousness" somewhat, and that also goes for Frasier and Niles. Sorry Tasos! If I will ever get off this stupid mobile and on to a proper keyboard, I will respond! I find this topic really interesting, so I am hoping to be able to post properly Monday/Tuesday. @heartofmotion: I don't think adressing specific members implies that only those should answer, but merely referring to certain posts. If I do that in the future I hope it does not deter you from answering as well :-). Jump right in - the more the merrier :-). I am with PistolPoet ont that topic. I do like the fact that Niles and Daphne got togther, but I think it could have been handled a lot better. I don’t understand why the writers felt the need to make those two compatible. Opposites can and do attract. Very early season Dahphne was indeed a bit ’too much’, but I find that by season 7 she had matured enough to be a believable partner for Niles. In my opinion a better example of two very different characters being teamed up are Monica and Chandler from ’Friends’ (a show I also like very much). Competitive, clean obsessed, control freak Monica and insecure, goofy Chandler stayed pretty much true to their characters and much of the later fun was derived from their difficulties and squabbles while trying to make their relationship work. Heartofmotion asked whether we want real characters or comical ones – for myself can definitely say: comical ones, as long as I watch a sitcom anyway. If I want more serious characterisation I turn to other shows, but I want to have fun while watching a sitcom. Needless to say that I am not a fan of the heart operation arc and other more serious episodes . Subject: Re: Last Episode You Watched?